Originally a peninsular, Lefkada is now an island. Over two and a half thousand years ago the Corinthians dug a canal along the eastern side which created an island. 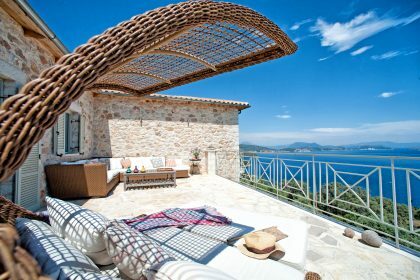 The west coast of Lefkada boasts long, sandy beaches and the vibe on the island is generally very laid back, all about the outdoors and having fun. There are 24 tiny islands in and around Lefkada which are very easy to get to. On the island are waterfalls, paths to hike and endless beaches to discover. With a coastline of 117 kilometres this is the island to come to for variety, watersports and having fun. There’s literally everything from diving, windsurfing (for which the island is very well known), kitesurfing and sailing as well as waterskiing, canoeing and just pottering around in small boats. Agios Ioannis is very well known for windsurfing and there are many competitions here which surfers travel to from all over the globe. Another nearby island is the mysterious private island of Skorpio. 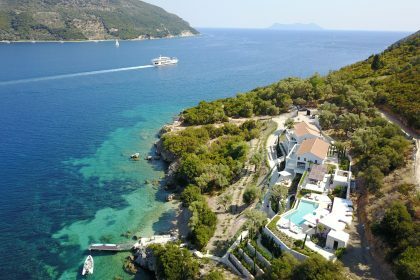 It belonged to the late shipping magnate, Aristotle Onassis and is now owned by his granddaughter, Athina. Onassis, his son and daughter are all buried on the island and it is thought that Athina’s staff go out to the island every day to maintain it...just incase she turns up one day. Traditional dishes include eglouvis lentils, salami, savoro (fish with herbs, raisins and garlic), soumada (a sweet drink made from almonds) & scrummy sweets such as mandolata (nougat) and pasteli (caramelized sesame seeds and honey). There is a vineyard on the island. Vasilliki and Millos beach are both heaven-sent for anyone with a burning urge to watch or take part in kitesurfing. There is also water skiing and boating which is a huge part of daily life on Lefkada. Rent a boat and potter around the coves or take a sailing boat and visit the lesser-known islands of Kalamos and Kastos. Glorious waterfalls to visit in the interior of the island. There is huge variety of what you can do in the evenings, from bigger clubs to sleepy bars and everything in between. The surfers have their favourite haunts and others are very Greek. Ask us and we will advise what is right for your group but, most of all, you’ll have fun! For those with a cultural bent, there are many museums (archaeological, historical and even a gramophone museum!). There are site visits to get involved with, beautiful churches to see and amazing nature to observe. For the people-watcher, Lefkada is just the place to be! The adventurous. Lefkada is very near so many other islands that it is very easy to island hop. Take a boat to Meganissi and spend the day on the beach there. Charter or skipper a boat for the day or the week. Spend a few days sailing before coming to Lefkada to a villa. Canoes and boats are also a sure hit. Aristotle Onassis, Jacqueline Kenned, Maria Callas and Greta Garbo are among those who have visited the island over the years.